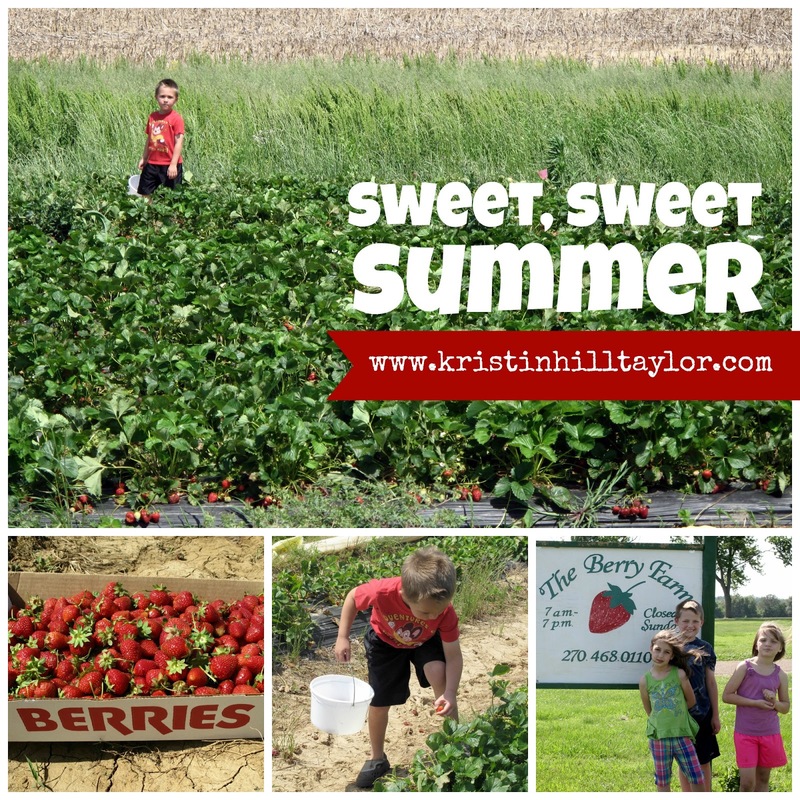 These strawberries we picked with our hands taste like summer, even more so than the ones we bought at Walmart and Kroger the past few weeks. These strawberries have become a May tradition for my kids and me – along with friends – at The Berry Farm. So, yes, I taste community in them too. We picked them Wednesday afternoon, taking advantage of the 85-degree sunshine that coincided with my daughter’s early dismissal school day. Courtney and I talked as we moved slowly through the rows of strawberries sprouting out of raised beds beneath plastic tarps. The kids moved faster, up and down dirt rows, then up a mound of dirt, then across the driveway to pet the dogs. It’s the fourth year my kids and I have gone with friends to pick these berries. I do think they get sweeter each time. Summer seems to be like that too. This favorite season of ours goes fast but we gobble it up as we go along. We swim and lunch and relax and read and vacation and catch up and slow down and make plans and play and work. And, you know, these summers are sweeter now that my girl is finished with first grade and we get a break in our routine that is built around the school calendar. We’ll be consuming more summer foods like pasta salad, broccoli salad, and grilled burgers and kabobs when we hang out with my family at the lake this weekend. There’s likely to be swimming and boating and fishing too. And not just this weekend, but throughout the summer. The strawberries are gone. We ate them with all three meals the past couple of days and I used the remaining few quarts to make a new-to-me strawberry cream cheese cobbler. I texted Greg a picture of the end result and suggested he come home for lunch so we could eat it together. My girl and I kind of limped into summer. The end-of-the-year projects and responsibilities were wearing on me, but I pressed through because I do believe we should finish what we start and do our best. I took store-bought cookies and a vegetable tray to the year-end program last night instead of the homemade appetizer and dessert I had considered making. These moments are good lessons in letting go for me and opportunities to talk to my girl about how we’re preapproved. And speaking of my girl, this spring has been hard on her respiratory system and sinuses. She’s been to the pediatrician four times since April 2. I was jotting down yesterday’s visit in her baby book when I noticed she’d these four pediatrician visits on the sick side of the waiting room are equal to the number of times she went in for sickness all of 2012 and 2013 combined. Crazy, huh? Yesterday’s visit was prompted by a 102.1 fever the night before her year-end program. Because sinus infections aren’t really contagious and her fever had been gone since around 10 a.m., we went on to the program. I would have had a broken-hearted girl had the doctor encouraged us to stay home. We went. She said her lines and sang songs. We socialized and reminisced with school friends. The school year came to an unexpected halt when she woke up this morning with a 103.2 fever. There was a time not so long ago in my life I would have been so frustrated that my girl had to miss the last two days of her first-grade year. And, yes, I’m frustrated today, but it’s for her and not that I’ve failed as a mom in some way over which I actually have no control. So, hello, Summer. We’re limping into to the break, but we’re so glad to be here – where sweet food and even sweeter community abound and hopefully sinus infections are fewer. Here’s a review of my friend Cathy Baker’s book “A to Z Summer Fun: Ideas to Inspire Family Fun” if you need such inspiration. This spring has been rough – hope your crew feels well soon! Hope you guys have a good weekend and your summer gets off to a good start. Good to see you here!